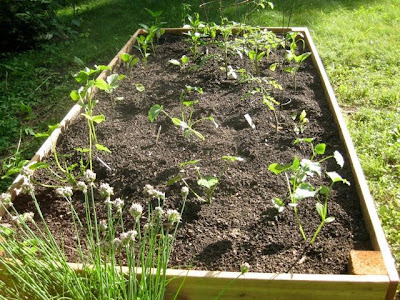 Here it is, the finished (and planted) garden bed! I was unsure of how close I really could plant everything. I know it's said that in a raise bed you can plant closer than normal but I didn't want to crowd the plants. So in the end I may have left some "unused real estate" but I'm ok with that. I'd rather judge how the plants grow in this year and based on that, decide how close to plant them next year. 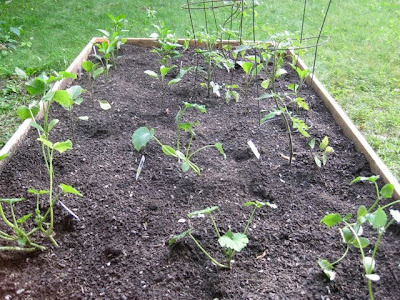 In the garden we have Tomato, Cherry Tomato, Eggplant, Cucumber, peppers (in green, yellow, orange and red), and zucchini. We also have a farm share- so I planted only what I thought we might want more of that's why there are no lettuce or greens (we get far too much of that from the share already and it's only the beginning of the season). This could be a big mistake by the way... if it's a banner year for these kinds of veggies we're in trouble. So if I have a Tomato giveaway on the blog sometime around August you'll know we're on the verge of being buried by produce!. In case you're wondering here's my list of materials for building the bed. Cut four 1.5 ft long pieces from the cedar post. Those will be the corners of the bed. The to make the long sides and complete the rectangle screw 2 full size 2x8 boards to the posts for each side. I used 2 screws to secure each side of the individual boards. Building the bed upside down worked the best. Then we flipped it and buried the remaining 6 inches of the corner posts to hold the entire thing in place. I was worried about the weeds and grass in the ground below the bed growing up into the nice soil we were about to fill the bed with. So we lined the bottom with 4 layers of newspaper and then filled it with the compost/soil mix. The newspaper will help to keep the weeds below from growing up into the bed and once the paper has kept the weeds down long enough for them to die back it'll break down turning into nutrients for the soil. At least that's how I hope it'll go, weeds are amazingly industrious plants- I hope they don't outlast the newspaper! All in all I'm pretty pleased with the project. We'll see how it goes- there might be a second bed built for next season if this one does well. 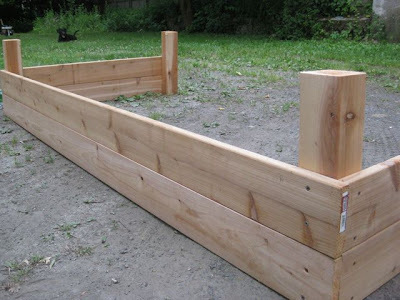 If you missed my previous posts about building the raised bed you can check them out here, and here.